"Net neutrality is not a partisan issue outside of Washington, D.C. Now we need to get D.C. to catch up with the rest of the country." ✊?TOGETHER ✊? WE ✊? WILL ✊? SAVE✊? #NETNEUTRALITY✊? Senate votes on CRA next week. Etsy, Reddit, OKCupid, and Foursquare are just some of the websites launching Red Alerts for Net Neutrality on their websites on Wednesday, urging users to contact their senators and demand that they join 83 percent of Americans in supporting the reinstatement of net neutrality rules. All 47 Democrats in the Senate along with Sens. Bernie Sanders (I-Vt.), Angus King (I-Maine), and Susan Collins (R-Maine) have committed to supporting net neutrality by filing a petition to force a vote on a bill that would overturn the FCC’s decision. Although 75 percent of Republican voters polled reported that they supported net neutrality at the time, Collins is the only Republican who has agreed to represent those constituents’ views. The “Red Alert for Net Neutrality” campaign is aimed at securing one last supporter of the petition. Sen. John Kennedy (R-La.) has hinted at potential support for a bill, and Fight for the Future is urging net neutrality advocates in other states to call their senators, pointing to Sens. Lisa Murkowski (R-Alaska) and Cory Gardner (R-Colo.) as potential supporters. Independent journalists, small businesses, and other non-corporate internet companies have been among the groups speaking out against the FCC’s decision for months. 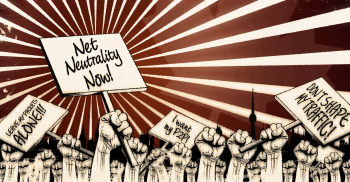 The net neutrality rules that the FCC voted to repeal keep internet service providers (ISPs) like Verizon and Comcast from giving favorable treatment to large internet companies by offering faster delivery of their content in exchange for extra fees. “This is a moment to use the internet and its ability to reach millions of people, give those people the ability to contact their lawmakers on an unprecedented scale, and frankly melt some phones in Washington, D.C.,” Greer told the Daily Beast.